March « 2008 « DON’T ROCK N ROLL NO! DON’T ROCK N ROLL NO! 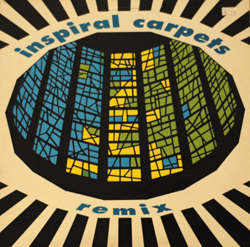 Published on March 8, 2008 in 12", 90s, electronic and single. 1 Comment Tags: 12", 1990, brit pop, dance, drums, remix. It’s time to get your early-90s dance on. This track is from the remix EP of the Inspirals’ downer hit single from 1990. The b-side of this ep, the “drum mix” is nearly unrecognizable as a derivative of the original single, but this version has a bunch of bit that you’ll remember. What I like most about this EP (aside from the cover) is that it seems to fundamentally betray the sentiment of the original song, without any hesitation. Crazy times. Published on March 4, 2008 in 80s, experimental and funk. 4 Comments Tags: 1981, 1985, cleveland, cover, spoken, vocal. Due to some irritating computer problems across three systems, I’ve been unable to post lately. Sorry for the delay. I hope, in the mean time, you’ve found that I’ve posted many great new music blogs to the Now Rock N Roll Now! section of the sidebar. Click through to find some great tracks. 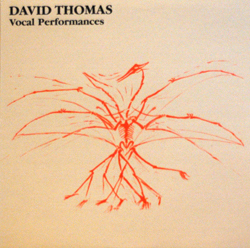 Today’s post brings together three tracks from Pere Ubu frontman David Thomas. The first two tracks are from the Vocal Performances 12″, and they suggest that Thomas may have been a bit reigned-in by the structure of Pere Ubu. The “Sloop John B” cover is just strange, and sounds like it was recorded secretly in a public place. The version of “Petrified” (which also appears, in a more fleshed out vein, on Songs of the Bailing Man) is a bit more engaging, but still feels like it was made for an empty audience. I think the sleeve for this disc is a masterpiece of graphic design. 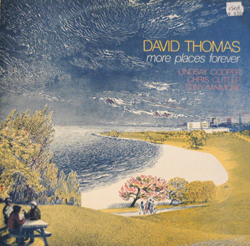 The third track in this post is David Thomas amongst friends, including Pere’s Tony Maimone on Bass. It’s more of a groover in the off-kilter Pere Ubu style. Relately and belatedly, RIP Jim Jones.